Creating or writing down goals may not be something that the average runner or even a more experienced runner may think about often, if ever. You may be asking, do I really NEED to set goals? Maybe you know you want to but aren't sure where to start. Throughout this post, I'm going to tell you not just why setting goals are so important, but also how to get started. Setting goals can help you achieve much more than you would think! Displaying your progress over time, whether it is a faster 1-mile time, faster pace, or further distance, can work wonders for improving your overall motivation and drive to continue getting healthier and more fit. Setting a goal, such as “I want to run a 5k” or “I want to compete in my first half marathon,” may seem like a daunting task. Whether you are a new runner or a more experienced runner, these goals may seem hard to reach. By setting realistic daily, bi-weekly, or weekly goals, it can put your tasks into perspective. Once you break your goals down into manageable milestones, it makes even the toughest task seem very achievable. A milestone is a "stepping stone" if you will, to help put those sometimes difficult goals into much easier tasks. 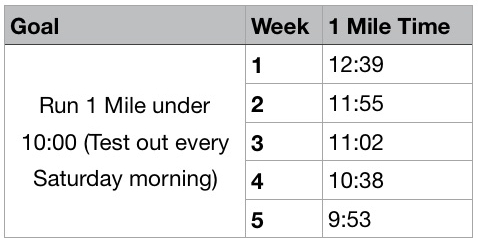 One of the most important things to do is track your progress throughout your days or weeks of running. It does, however, require patience. Results are not immediate. Tracking your progression over a few weeks of running, you will likely see an increase in speed, ease of a longer running duration, or an overall better feeling while running. How do we do we set a goal? For some, this may be the golden ticket for achieving your goals. It helps to give yourself some wiggle room during the week just in case school, work, or the weather gets in the way. How do we track progression? Let's say that you are not quite ready to commit to a 5k, but instead, you want to achieve a 1-mile time under 10 minutes. By tracking your progress (weekly in this case, but can be bi-weekly, or monthly), you will start to see your 1-mile time dropping, giving you more and more motivation to push yourself that much harder next time. Yes! It's time for another chart! Some people might get discouraged after a week if they haven't achieved their goal of running under a 10-minute pace, but by keeping track of your progression, you can see that each and every week your pace gets faster and faster! Simply writing these numbers down can kick-start your motivation the following week and actually make you look forward to seeing how low you can get your pace next week! When you put a task in your mind to train for, whether it be a 1-mile sprint, 5k, 10k, or a marathon you are much more likely to achieve your goals in a set timeline. In fact, this study says that you are 42% more likely to achieve a goal simply by writing it down. A positive outcome of tracking your progress is an increased desire to continue pursuing your goals and even pushing yourself beyond your current goals. Goal setting plays a huge role in achieving your goals, not only with running but all forms of fitness. Without setting goals, there is no drive to progress, nor is there guidance on what to achieve. I personally like to break down goals on a weekly basis, but others may be better with setting bi-weekly or monthly goals. No matter how you break it down, just write it down, track your progression and continue to challenge yourselves and you will see results. Newer PostHip Drop: What is it, and how do we prevent it? Older PostTop 9 Benefits of running.